Revered by the early Aztec and Mayan cultures, chia seeds are a superfood packed with fiber, protein, omega-3 fatty acids, and antioxidants. 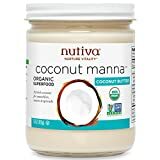 Tiny but mighty Nutiva organic chia seeds are versatile for use in recipes both savory and sweet, including yogurt and oatmeal, or in smoothies, added to sauces as a thickener and to muffins and cakes as an egg replacement. Try Nutiva organic chia seed today! Organic Milled Chia SeedNutiva grinds fresh whole chia seeds for your convenience. Enjoy these milled chia seeds in yogurt, oatmeal, baked goods, or smoothies. Organic White Chia SeedNutiva offers both black and white chia seeds-the main difference being visual, with the white seeds preferred for some baking recipes. 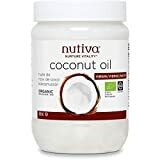 Cold-pressed and unrefined, Nutiva’s Virgin Coconut Oil has a delicious tropical flavour and scent. It’s ideal for sauteing and baking or as a butter replacement in any recipe. Also excellent for body and haircare.